The Canada Land Inventory is a comprehensive multi-disciplinary land inventory of rural Canada, covering over 2.5 million square kilometers of land and water. Land capability for agriculture, forestry, wildlife, recreation, wildlife (ungulates and waterfowl) was mapped. Over 1000 map sheets at the 1:250,000 scale were created during the 1960's, 70s, and early 80's. 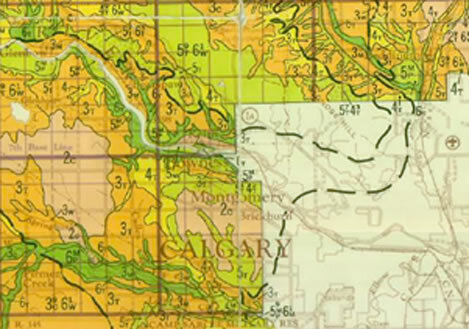 Although the information is somewhat dated, and better information is available for some areas as part of more recent soil surveys, the interpretations are still largely valid, and many jurisdictions still use these CLI maps for land use planning purposes. There are seven classes used to rate agricultural land capability. Class 1 lands have the highest and Class 7 lands the lowest capability to support agricultural land use activities. Subclasses are used to identify specific limiting factors for each class, such as adverse climate, moisture, salinity, topography, etc.